On December 6, the BEAM Grace Garden was presented the 8th Annual Beaches Watch “Give-Back” donation. Mary Ellen Waugh, BEAM Food Operations manager and Lori Richards, BEAM Executive Director were in attendance to receive the $1,000 donation and provide a presentation about the work being done by BEAM and the Grace Garden. 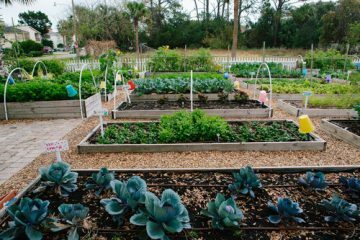 Built in April 2013, the BEAM Grace Garden supplements the fruits and vegetables offered in BEAM’s food pantries. Located adjacent to BEAM’s offices, the 6,000 sq. ft. production farm has fifty-nine 4’ X 12’ raised beds, 8 fruit trees, a fence full of raspberries and blueberries, and an herb and butterfly garden. BEAM’s Grace Garden also operates a 16’ x 24’ greenhouse where they start all of the garden plants from seed. Taking advantage of all available growing space, the Grace Garden has a Shitake mushroom farm in a shade enclosure on the side of the BEAM building. And in an effort to explore new growing techniques for food production in low income urban settings, the Grace Garden has added aeroponic, vertical growing to the garden’s production capabilities. The 12 vertical aeroponic growing towers require 10% of the water needed by conventional farming and plants grow in 2/3 the time. Operating almost exclusively with volunteers, The Grace Garden at BEAM provided more than 7,500 pounds of fresh produce and fruits to our pantry clients in the last year. The Beaches Watch annual Give-Back donation supports outstanding nonprofit organizations that help enrich the quality of life of beaches residents. 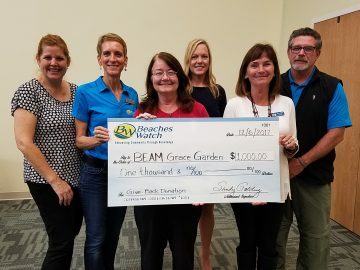 “Beaches Watch is proud to present this Give-Back donation to the BEAM Grace Garden to show our appreciation for all they are doing to enhance the quality of life for our beaches communities. We hope this donation will help them continue the great work they are doing to provide fresh food to our beaches neighbors in need,” said Beaches Watch President Sandy Golding. Beaches Watch is a non-profit, non-partisan civic organization whose mission is to promote and facilitate educated and productive citizen involvement in local and state government decisions that affect the quality of life of our beaches communities in Duval County, Florida. Beaches Watch achieves this by raising, monitoring and researching issues; providing factual issue information to the general public and government officials; encouraging citizen participation in the solutions to beaches growth and quality of life issues and organizing citizens for action.